To register, for Business-to-Business or sponsorship opportunities please contact: Ms. Aretha Nozipho Bohlela at: aretha@africatourismpartners.com or +27 81 303 7030. The Seychelles Tourism Board (STB) attended the Spotlight Africa Workshop held in Lusaka, Zambia, which took place on the February 13, 2019, organised by Houston Travel Marketing Services. The Spotlight Africa Workshop is a business platform that provides opportunities to establish direct contacts besides encouraging networking with the trade. 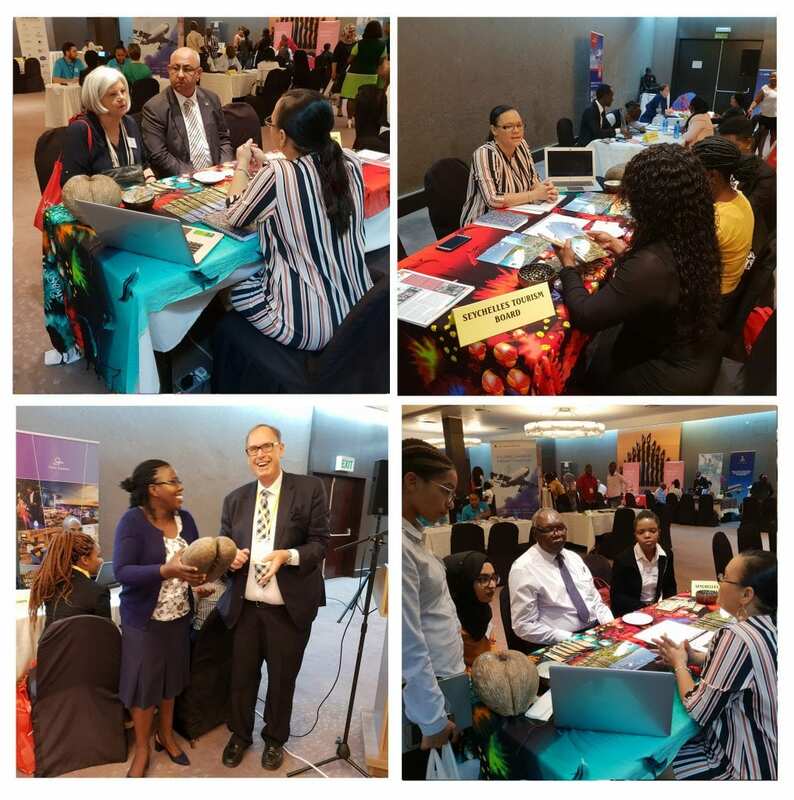 The aim of the STB’s participation at the 2019 workshop was to entice trade partners to place more focus on the exotic islands as an affordable yet luxurious destination in the African region. Speaking about the destination’s participation to this Spotlight workshop, Mrs. Sherin Francis STB Chief Executive mentioned the importance of increasing visibility for the destination on all markets. “As a tourism board, we do not sell a mere product; we sell dreams and memories. Our participation to big trade fairs are important but we cannot also neglect smaller workshops in new markets as it is the time we create new networks with partners with potential to sell our destination,” said Mrs. Francis. Representing STB was Senior Marketing Executive, Mrs. Natacha Servina, who noted that the amount of interest received during the workshop was above expectation. “Efforts and emphasis were to transform and convert the mind-set of many visitors and showcase the more affordable side of Seychelles where I strongly believe more focus should be derived from and that this market is worth the investment for further development,” said Mrs. Servina. The STB representative also noted that Seychelles was not only a destination attracting the local visitors from Zambia present at the workshop. She mentioned that there was also interest showed by the expatriates residing in Zambia, who visited the STB table, proving that there is great potential for growth on this market. STB features alongside industry professionals including travel agencies and major tour operators who are considered major key players in the Zambian Travel Industry. The workshop’s facilitator, Mr. Derek Houston mentioned his satisfaction with the turnout and participation received for this year, noting that The Spotlight on Africa Workshop Lusaka will remain on the organiser’s plan for 2020.